Download "Knowledge Management Challenges in Web-Based Adaptive e-learning Systems"
4 Vasilyeva E., Pechenizkiy M., Puuronen S.: Management Among the main contributing participants of any e-learning system are students, teachers, knowledge engineers, usability engineers, system architectures (developers), administrators, and psychologists. All they have their own perspective to the e- learning environment. about users (students) is usually, at least mainly, collected using monitoring [Paramythis, 04] while the other participants mainly use other interfaces to deliver their contribution. On the right hand box in Figure 1 the main data repositories needed in the system are named. Beside the learning material itself the system needs several types of knowledge and meta-knowledge to be able to adapt effectively and efficiently. In figure these include assessment data, user models/profiles, data log, and knowledge about adaptable characteristics. In the middle part of Figure 1 we have named beside the adaptation engine itself some other engines offered to main participants for keeping repositories updated. The general architecture (Figure 1) is planned to be able to offer the types of adaptation suggested in [Paramythis, 04]. For content discovery and assembly knowledge about users is collected by monitoring and further included in the user models/profiles repository using software tools and meta-knowledge created by the system architects, knowledge engineers, and teachers. Meta-knowledge for adaptive course delivery is mainly acquired from teachers, and usability specialists. 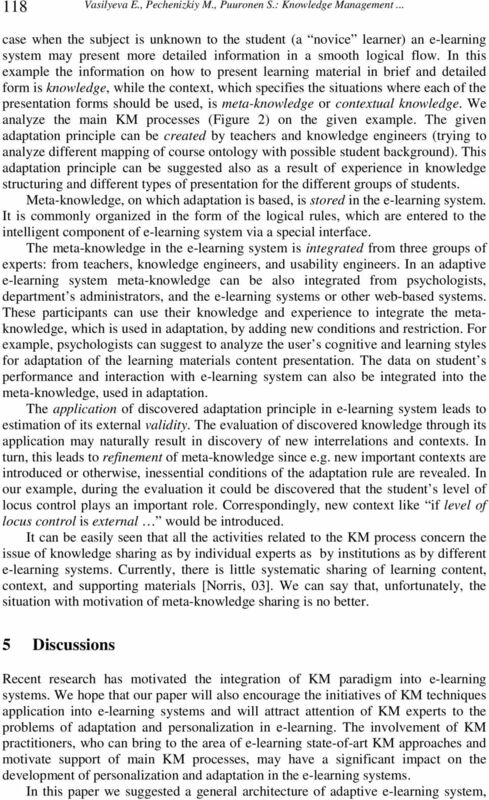 The role of adaptive interaction meta-knowledge is to point out the context in which the adaptation should be performed. The meta-knowledge for this type of adaptation is mainly formed on the base of knowledge, which could be acquired from usability specialists, psychologists, and from the experimental studies of the interaction between the user and the system. 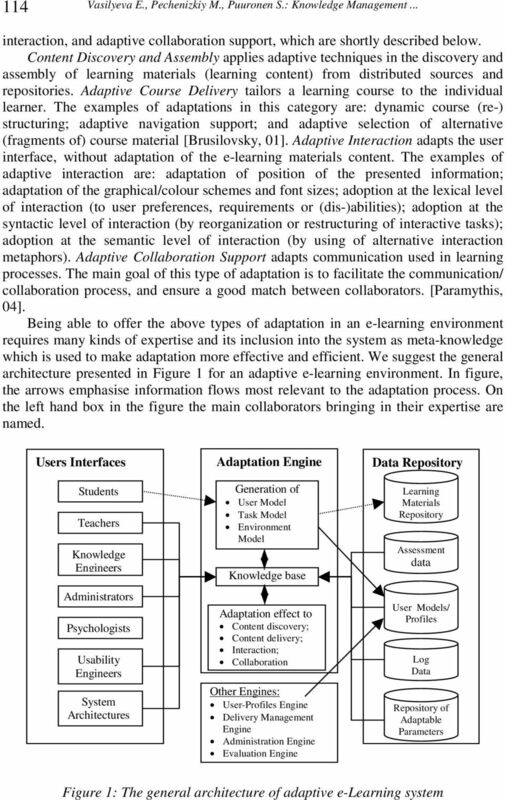 Adaptive collaboration support type of adaptation emphasizes the collaboration approach to learning by using communication between multiple persons, cooperative learning, communities of learners, social negotiation, and apprenticeship in learning [Paramythis, 04]. For this type of adaptation the meta-knowledge could be acquired from psychologists, usability engineers, and communication experts. Usability engineers, teachers, knowledge engineers, psychologists, and last but not least developers define what can be adapted in the system. In KM one of the main problems is storage and re-use of the knowledge that is accumulated with experience. In e-learning systems such knowledge can be accumulated both by the system itself and by the participants of the e-learning environment. For example teachers can analyze students performance as well as the statistics of students interaction with the e-learning system (e.g., how long the student has studied certain material, or how many mistakes were made in the test, etc). This knowledge allows the teacher to restructure the learning material, and to refine learning scenarios and test tasks. The key issue here is that KM specialists can be involved in the development of an adaptive e-learning system. They can import traditional KM techniques that would motivate to organize and maintain basic KM processes in e-learning systems for adaptation purposes. 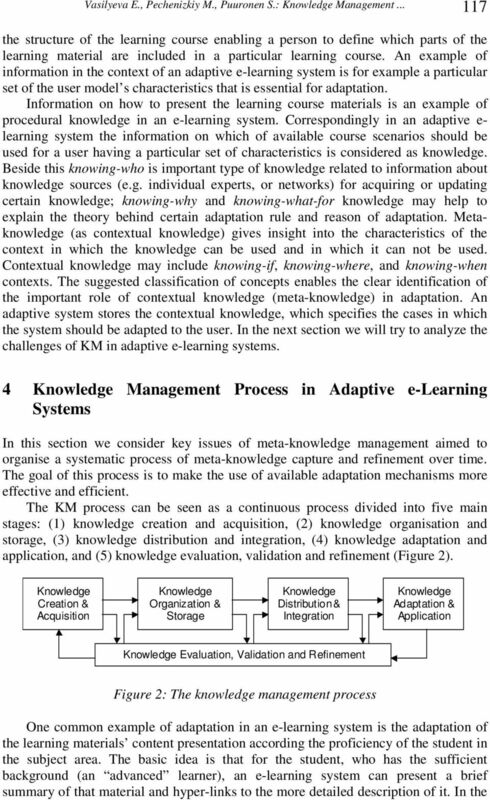 In next section we consider main KM processes with regard to adaptation context. 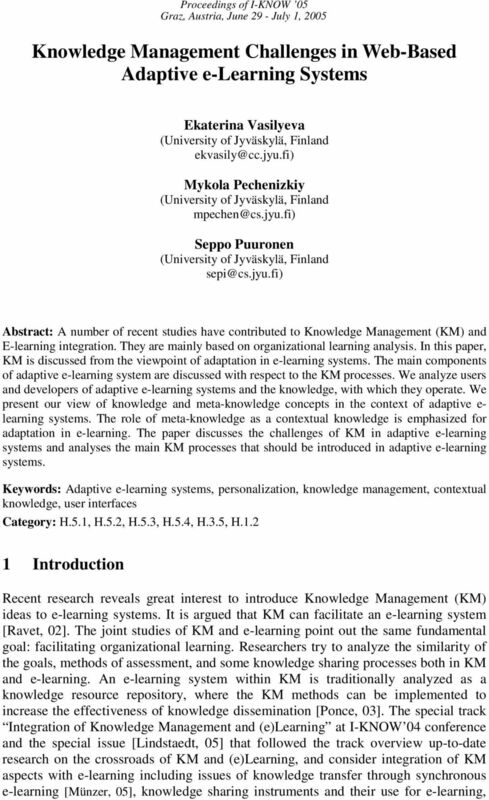 8 Vasilyeva E., Pechenizkiy M., Puuronen S.: Management considered different dimensions of knowledge concepts and the organization of metaknowledge inside our general architecture, and discussed knowledge management processes in an adaptive e-learning system aimed to make the use of available adaptation mechanisms more effective and efficient. 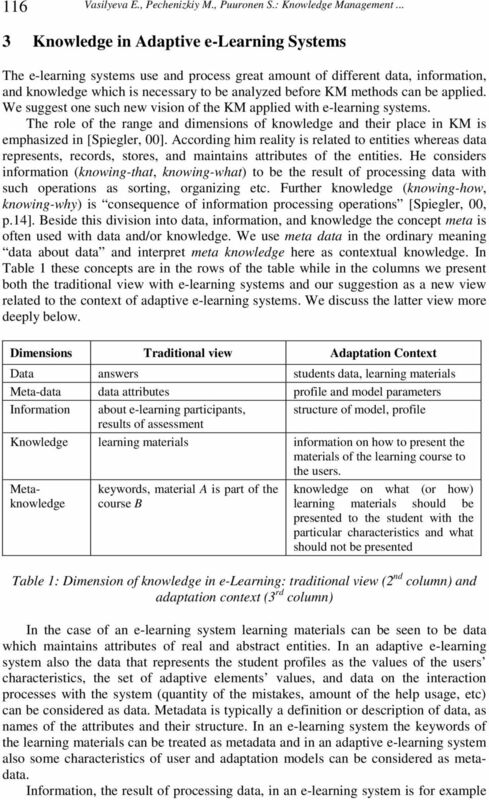 Behind these suggestions is our belief that the support for the systematic process of meta-knowledge capture and refinement over time would improve e-learning system s adaptation and contribute to further research and development of adaptive e-learning systems. Our further studies are directed towards the development of guidelines for adaptive e-learning systems design, addressing the issues of effective metaknowledge creation, discovery, and acquisition; organization and storage; evaluation, revision and application for adaptation of content discovery, assembly and delivery; user interface and collaboration support. Acknowledgements This research is partly supported by the COMAS Graduate School of the University of Jyväskylä, Finland. References [Brusilovsky, 01] P. Brusilovsky, Adaptive hypermedia. 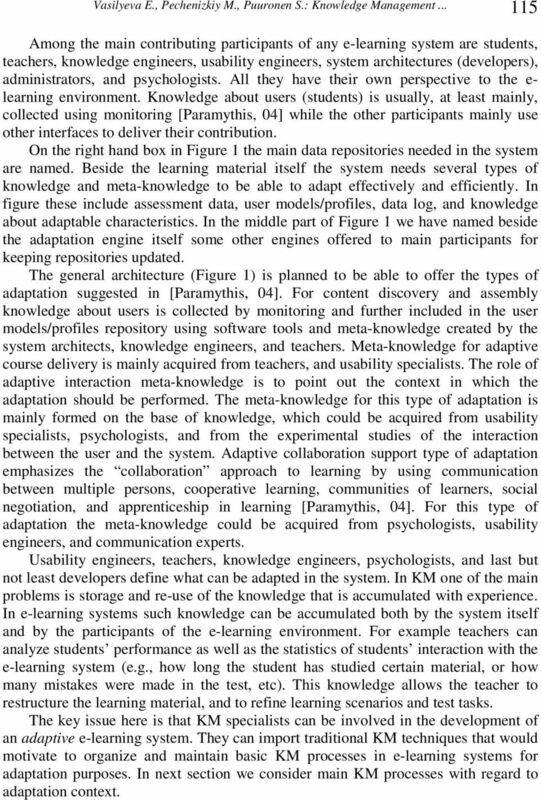 User Modelling and User Adapted Interaction, Ten Year Anniversary Issue (A. Kobsa, ed. ), 11 (1/2), 2001, [Köhler, 05] Köhler A., Fuchs-Kittowski F., Integration of Communities into Process-Oriented Structures, J.UCS, (Journal for Universal Computer Science), 11, 3, 2005, [Lindstaedt, 05] S.N. Lindstaedt, J. Farmer, Integration of Management and (e)learning. J.UCS, (Journal for Universal Computer Science), 11, 3, 2005, [Marshall, 03] B. Marshall, et al. Convergence of Management and e-learning: the GetSmart Experience. Proc. of JCDL 2003, [Mason, 05] J. Mason, From e-learning to e-, in Rao (ed.) Management Tools and Techniques, Elsevier, London, 2005, [Münzer, 05] S. Münzer, B. Xiao, Small Groups Learning Synchronously Online at the Workplace: The Interaction of Factors Determining Outcome and Acceptance, J.UCS, (Journal for Universal Computer Science), 11(3), 2005, [Norris, 03] D.M. Norris, J. Mason, R. Robson, P. Lefrere, G. Collier, A Revolution in Sharing. Educause Review, vol. 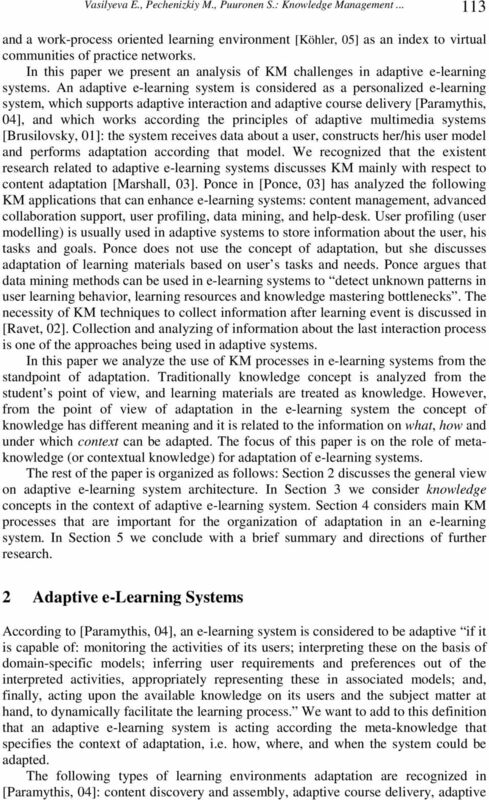 38 (5), 2003, [Paramythis, 04] A. Paramythis, S. Loidl-Reisinger, Adaptive Learning Environments and e- Learinng Standards. Electronic Journal of e-learning, 2 (1), 2004, [Ponce, 03] D. Ponce, What Can e-learning Learn From Management? Proc. of 3rd European Management School, San Sebastian, [Ravet, 02] S. Ravet, E-Learning and Management. The Newsletter of the PROMETEUS Network N 20, July-August 2002, 2-6. Available at [Spiegler, 00] I. Spiegler, Management: A New Idea or a Recycled Concept? Communications of the Association for Information Systems, 3, Article 14, 2000. Why Data Mining Research Does Not Contribute to Business? Computer Modelling and New Technologies, 2011, Vol.15, No.4, 41 45 Transport and Telecommunication Institute, Lomonosov 1, LV-1019, Riga, Latvia ANALYSIS OF WEB-BASED APPLICATIONS FOR EXPERT SYSTEM N.
01219211 Software Development Training Camp 1 (0-3) Prerequisite : 01204214 Program development skill enhancement camp, at least 48 person-hours. IT Services Management Service Brief Capacity Management Prepared by: Rick Leopoldi May 25, 2002 Copyright 2002. All rights reserved. Duplication of this document or extraction of content is strictly forbidden. A Capability Model for Business Analytics: Part 2 Assessing Analytic Capabilities The first article of this series presented the capability model for business analytics that is illustrated in Figure One. E-Learning at Kyongju University in Seoul, Korea: the Present and the Future Hyunju Jeung, Ph D Full-time lecturer Kyongju University hjeung@kyongju.ac.kr Abstract Internet is spreading fast in our lives. Potential of Cloud Storage Application as Management System T. Gunadham Abstract This study discusses the results of analysis on cloud storage application in the term of facilitating knowledge management. Expert System and Knowledge Management for Software Developer in Software Companies 1 M.S.Josephine, 2 V.Jeyabalaraja 1 Dept. of MCA, Dr.MGR University, Chennai. 2 Dept.of MCA, Velammal Engg.College,Chennai. Could Knowledge Management Help You Operate A More Effective & Efficient It Service Desk?